Microsoft announced today a preview for its Office for Android tablets, while also updating the suite’s iPad and iPhone apps. Android tablet owners can opt-in to participate by filling out a short survey. Eligible users should be using an Android tablet running Android 4.4 KitKat with a size between 7″ and 10.1″. Those with tablets running the latest Android 5.0 Lollipop won’t be accepted, as the company isn’t seeking such beta testers yet. Weirdly, Microsoft asks prospect beta testers to avoid installing system updates to the OS on the tablet in order to participate. Office is free on Android, iOS and Windows Phone. It offers basic features of viewing and editing documents, but advanced options require an Office 365 subscription. If you’re interested in becoming a beta test, follow the source link below. 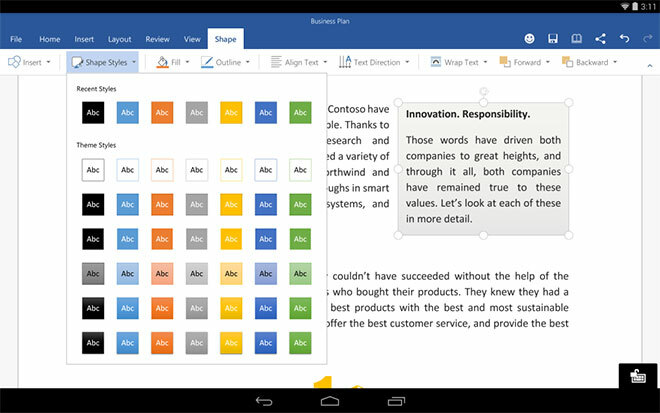 Microsoft plans the availability of the Office for Android tablets to happen in early 2015.